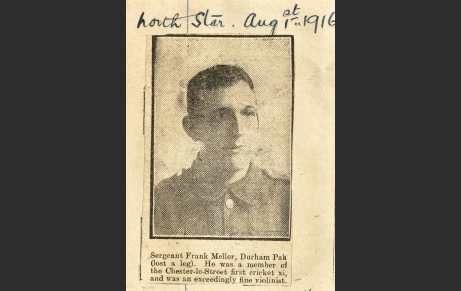 From Chester le Street, served with 18th Battalion DLI (Durham Pals). Born in Triangle, a small town in Yorkshire, Frank Mellor, son of Thomas and Isabella, farmers, moved to Chester Le Street where he was working as a teacher in 1911. He enlisted in the 18th Battalion of the Durham Light Infantry, becoming a sergeant. He lost a leg while serving, being consequently discharged of his duty in 9 June 1917. Mellor was a member of the Chester-le-Street first cricket XI and also played the violin. Siblings: Sarah, Thomas, John, Thomas, Annie, William, Harry, James.